ISLAMABAD -- Pakistan's legendary philanthropist Abdul Sattar Edhi, who devoted his life to the poor and the destitute, died on Friday at a hospital in Karachi following a prolonged illness. He was 88. Edhi's family announced his death and his son, Faisal Edhi, asked all people to "pray for the departed soul" of his father. Earlier in the day, the family had said that Edhi's condition deteriorated and that he was breathing with the help of a ventilator. Edhi had been hospitalized for the past several weeks and his son said he was suffering from kidney- and sugar-related problems. Known in Pakistan as "Angel of Mercy" for his social work that also won international acclaim, Edhi had established a welfare foundation almost six decades ago that he oversaw together with his wife, Bilquis Edhi. The foundation owns and runs Pakistan's largest ambulance service, as well as nursing homes, orphanages, clinics and women's shelters, along with rehabilitation centers and soup kitchens across the country. Prime Minister Nawaz Sharif expressed his condolences and sorrow over Edhi's passing and said he prayed that God will give the charity worker "the best place in paradise." Edhi was a "real gem and asset for Pakistan," Sharif said in a statement. "We have lost a great servant of humanity. He was the real manifestation of love for those who were socially vulnerable, impoverished, helpless and poor." "This loss is irreparable for the people of Pakistan," the prime minister added. Pakistan's powerful army chief Gen. Raheel Sharif also expressed his condolences to Edhi's family, lauding him as a "true humanitarian." Crowds of people were gathering outside the Karchi hospital late Friday night to express their condolences to the family. Edhi came from humble origins and remained a quiet and modest man all his life, which in part was what inspired the nationwide love for him among Pakistanis. His son said that before his death, he asked that his eyes be donated to a person in need. Born in 1928 in a small village of Bantva near Joona Garh in Gujarat district of then British-ruled India, Edhi was deeply affected by the death of his mother when he was 19. He never finished school but later said that the world of suffering became his tutor. Edhi migrated to Pakistan in 1947 and made a living at first by working as a commission agent selling cloth at the Karachi wholesale market. A few years later, he started a free Bantva dispensary with the support of some community members. That was the start of his charity work. In time, he turned his vision of developing a systemized welfare service and drew a persistent and wide response for donations, expanding the trust at a remarkable pace. He first set up a maternity home and the emergency ambulance service in Karachi, which at the time had a population of over 10 million. In 1965, Edhi married Bilquis Bano, a nurse who worked at the Edhi dispensary. The couple has four children, two daughters and two sons. Bilquis ran the free maternity home and organized adoption of abandoned and out-of-wedlock children across Pakistan. As their work spread across the country, Edhi remained involved hands-on in the Edhi Foundation, from raising funds to helping with ritual bathing of the bodies of the deceased poor. He also personally drove one of the network's ambulances across Karachi to help anyone in need. Edhi's foundation also provides technical education to the disadvantaged, religious education for street children, consultations on family planning and maternity services, as well as free legal aid, financial and medical support to prisoners and the handicapped. His work earned him numerous awards at home and abroad, including the Gandhi Peace Award, the 2007 UNESCO Madanjeet Singh Prize, the 2011 London Peace Award, the 2008 Seoul Peace Award and the Hamdan Award for Volunteers in Humanitarian Medical Service. Known in public as Maulana Edhi - a respectful title for a religious scholar, usually an elderly person with a beard - he supported and promoted working opportunities for women. 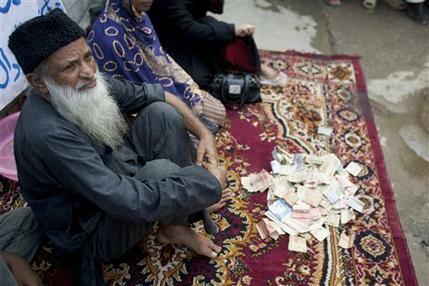 Out of the 2,000 paid workers of his Edhi Foundation, around 500 are women. Prime Minister Sharif also announced Saturday as a day of mourning in Pakistan and said Edhi would be given a state funeral on Saturday in recognition for his services. Sharif, who is returning to Pakistan from London where he underwent open heart surgery, expressed regret that his health would not allow him to personally attend the funeral.